Guys, I feel as if I’ve really been slacking with this whole blogging thing lately, and it stinks…it really does. Since college started back up, it’s like I just can’t catch enough hours in the day to do everything I want to do. You know? It’s like….kinda wanna spend 6 hours in the kitchen recipe testing…kinda also wanna get a degree. Tough life I’d say. Luckily, I managed to make use of my free weekend to do what I absolutely loooooove to do best (well, 2nd best…right after eating) which is cooking and baking! 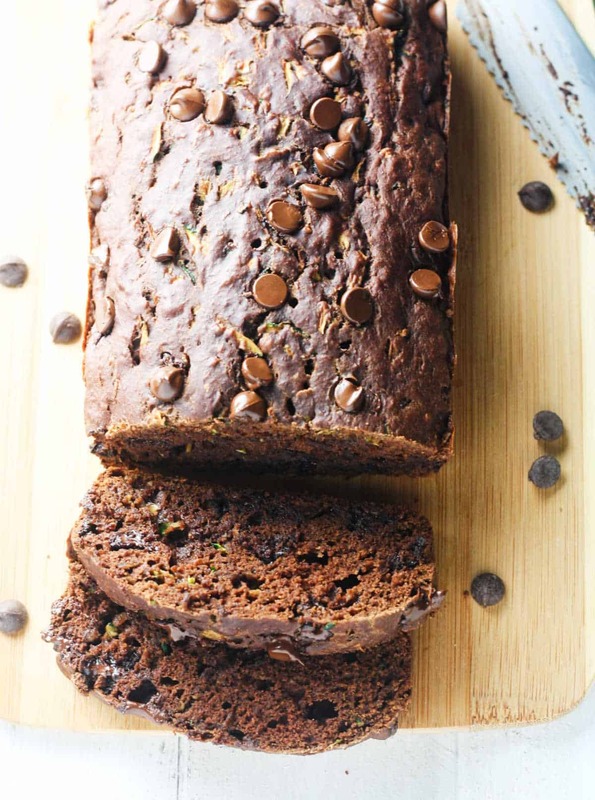 On today’s menu, we have a deliciously moist Double Chocolate Chip Zucchini Bread. Just take a moment to soak that all in…. it’s freaking amazing. Every few weeks, I like to raise my adulting game to the next level by partaking in a particularly productive activity of cleaning out my refrigerator. Honestly, I never seize to amaze myself with what I actually find lurking at the bottom of the crisper or hiding at the very back in a questionable Rubbermaid container. It’s like…when I’m at Kroger and I see those sale signs, I don’t even try to think rationally..everything is thrown into that cart. It’s rather…unhealthy really. While I was doing my routine clean out, I realized that sometime during my multiple weekly Kroger trips, I’d managed to hoard 7 zucchini. SEVEN. I immediately thought “what am I even supposed to do with seven zucchini that are due to expire in a week? How did I even manage to end up with 7 zucchini in my fridge? Why did I not check before I bought two more at Kroger this morning?”The list of questions, guys…was endless. So I pondered on the possibilities for recipes that I could jam a bunch of zucchini in, that would also be fairly quick and easy (bc college homework probs). What I came up with, was that my family would be having zoodles for the next week. There, problem solved. Okay…just kidding. I’m not that predictable. I decided to throw some baked goods into the mix and one of the end results just happened to be this deliciously rich and chocolaty Double Chococlate Chip Zucchini Bread which I absolutely had to share with you guys, because I just ♥ y’all that much. I lightened up this bread by substituting the butter with applesauce and a little light vegetable oil spread. The moisture however, was not compromised in the slightest. So good! Preheat oven to 330 degrees F. In a large bowl, combine the flours, cocoa powder, baking soda, nutmeg and salt, set aside. In a separate bowl, whisk together the egg, brown sugar, applesauce, vegetable oil spread and vanilla. Gradually whisk in the dry ingredients until fully combined. Gently fold in the shredded zucchini and chocolate chips, reserving about a tablespoon of chocolate chips to sprinkle on the top. Spray a loaf pan with nonstick spray and pour in the batter. Top with the remaining tablespoon of choclate chips and bake for 45-55 minutes or until a toothpick inserted into the very middle of the bread comes out clean (toothpick may have chocolate on it from the chocolate chips - this is okay). Allow the bread to completely cool before removing from the pan. Slice into 12 even slices and enjoy!